My life has changed so dramatically that I would like to share my journey with you. While Lisa lost 14.9kg, her story reveals how so very much more about the positive changes that took place in her life. For a long time, I abused my body with overeating, blaming it on the emotional issues which were going on in my life. I would hide behind a professional veil at work then come home and collapse in front of the TV. I was continually tired, lacking in self esteem and didn’t have the energy or motivation to do anything else. I would turn down invitations from my friends to socialize because I was embarrassed at the way I looked. My life had become very lonely and isolated, but I felt powerless to stop the cycle of self sabotage. I realised at that point I had lost all control of my life. I wanted so disparately to regain control and enjoy a happy balance life. The turning point came when I met my personal trainer, Dwayne Thomas and he introduced me to the 20 Week Challenge. When I first met Dwayne I was adamant that I only wanted to walk around the hills, I hated the thought of running and I was a gym-phobic, all I needed was someone to motivate me and get me out of the house! On our sessions Dwayne would talk to me about nutrition, and healthy living in general. Every day I would have a question for him as I threw myself into my self development. It soon became apparent to me that loosing weight was only a small percentage of the changes I wanted to make to my life. Dwayne designed a healthy eating nutritional plan for me that taught me how to plan and prepare my food, it didn’t take me long before I understood the significance of “you are what you eat” really meant. My fitness programme was designed to be varied and fun, as he knew I became bored very quickly, we would walk the hills and go tramping. As I began to loose weight my energy levels increased and I started feeling a lot more positive about myself and about life. The categories that Dwayne and I had chosen on the 20 week challenge helped me set my goals and focus on working towards achieving those goals. 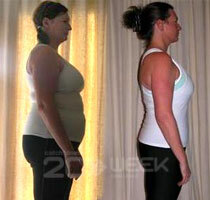 The tests throughout the 20 week challenge kept me motivated and inspired me to improve my results. I was always determined to beat my previous time. And if I was honest, I secretly wanted to beat the other guys too. It wasn’t long before Dwayne got me running, I loudly protested at first – he knew how much I hated it, I can hear myself saying to him “never in a million years will you get me running”. Five weeks into the 20 week challenge I ran the 12km city to surf race in 1 hour 26mins and now I am hooked. If I can’t get up into the hills for a run I get so grumpy. Dwayne worked hard on increasing my endurance and stamina, improving my cardio fitness, every day was a different challenge! Although my cardio fitness was steadily improving I wasn’t building muscle which I meant only one thing – working out with weights in the gym… Just at the mention of the word “GYM”, I used to freeze. This was something else I had said to Dwayne “There is no way on this earth you will get me into a gym”. Dwayne indicated to me that building muscle was important for my weight loss goals. It took me a good couple of months before I could go to the gym and not have a panic episode or feel nauseous. Seeing the results of the weights and circuit training has given me new confidence in the gym and I can actually walk in without feeling physically sick. I have implemented many changes in my life, and have a new philosophy to life; I embrace each day with love and passion which completely amazes me. I’m healthy, happy and enjoy a wonderful lifestyle now, something that only a few months ago I could only dream about. My friends and family are amazed at the physical and physiological transformation that has happened to me in the last 20 weeks. At the start I just wanted to lose weight, but I have found myself a new life. I am proud of my achievements, and it is with Dwayne’s inspiration, motivation and support through every step of my journey that I found the courage and determination to be the person I wanted to be. I never believed I could feel this good – if I can do it…anyone can!